Amy Johnson Crow, the author of the blog No Story Too Small, is the host of the 52 Ancestors in 52 Weeks Blog Prompt series. If you are not familiar with the project please click on the following link: Announcing 52 Ancestors in 52 Weeks: 2015 Edition. Week 19 (May 7-13) – There’s a Way: What ancestor found a way out of a sticky situation? You might also think of this in terms of transportation or migration. So I decided to go along with using the theme this week. Herbert Cheeseman was my 1st cousin 2x removed on my paternal side. My paternal great grandmother was Frederica Augusta Inniss. She had a sister named Martha Elvira Inniss Cheeseman who was Herbert's mother. This branch of my family tree comes from Barbados. My grandfather ,Harold Murrell, came to this country in search of a better life. He arrived on September 29, 1927 in New York, NY. I had no idea that he had family here until I found him listed on the 1930 Federal Census. Herbert Cheeseman and my grandfather Harold Murrell resided together with two other lodgers at 393 Edgecomb Ave in New York City. 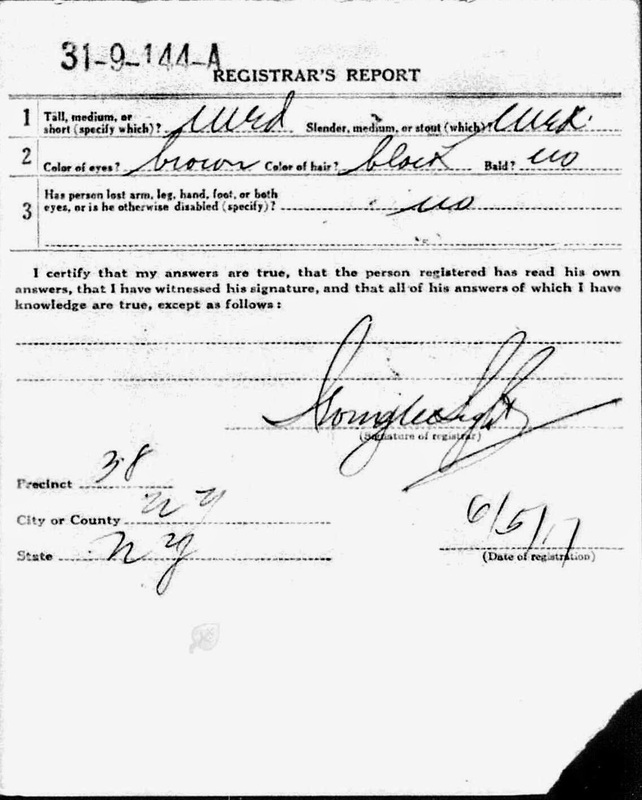 According to this census entry, it says that Herbert arrived in the U.S. in 1917. When my grandpa came to New York, I am sure he appreciated the guidance his cousin Herbert provided him. It's good to know that they had each other to rely on for support. 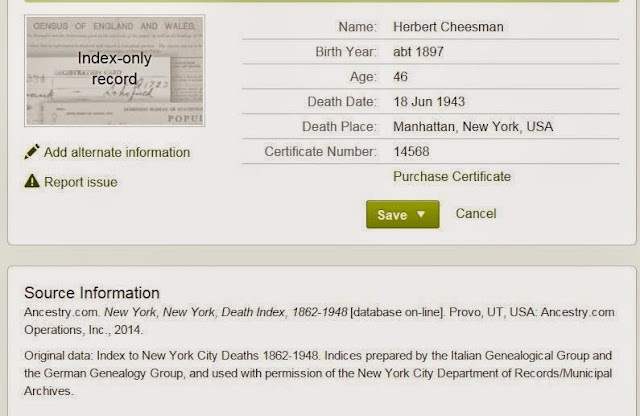 I learned how Herbert Cheeseman had "made his way" to New York when I reviewed his naturalization records. 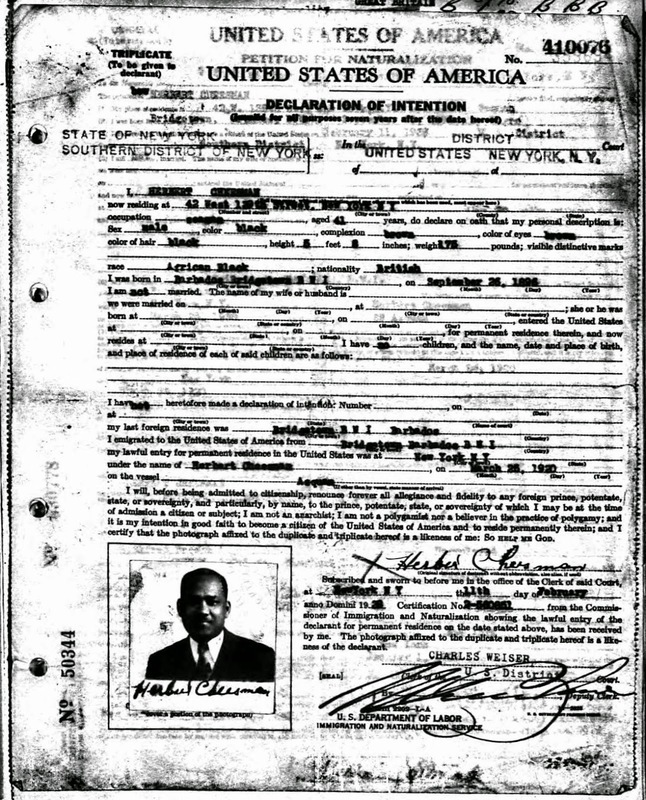 Herbert made his declaration of intent to become a U.S. citizen on February 11, 1938. At that time, he was living at 42 West 139th St, NY, NY. According to this document, he was born in Bridgetown, BWI (Barbados) on September 26, 1896. Herbert stated that "his lawful entry for permanent residence in the United States was at New York, NY under the name Herbert Cheeseman on March 25, 1920 on the vessel, SS Asquam." 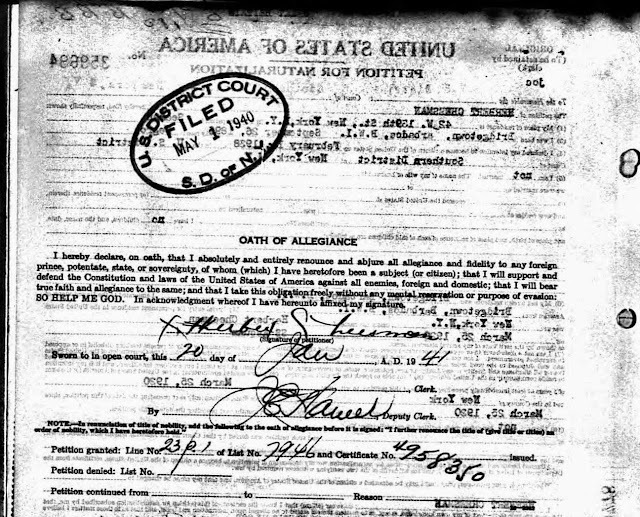 There's a little bit of a discrepancy here on his timing of arrival between the 1930 census and Herbert's naturalization papers. The census said 1917, the papers said 1920. Perhaps this change of date was due to a memory lapse on my cousin's part when he was filling out his papers? In any event, I found Herbert Cheeseman's World War I Draft Registration Card which was registered on June 5, 1917. He probably arrived in America a few months prior to that. Source Information Ancestry.com. U.S., World War I Draft Registration Cards, 1917-1918 [database on-line]. Provo, UT, USA: Ancestry.com Operations Inc, 2005. Original data: United States, Selective Service System. World War I Selective Service System Draft Registration Cards, 1917-1918. Washington, D.C.: National Archives and Records Administration. M1509, 4,582 rolls. Imaged from Family History Library microfilm. 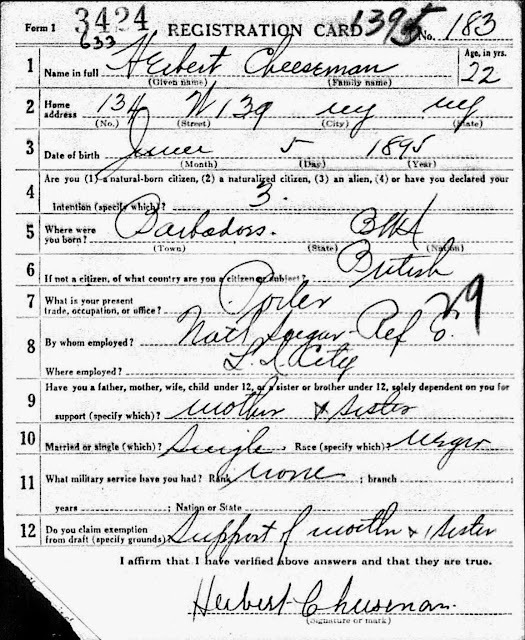 In 1930, Herbert Cheeseman's occupation was a "porter" in an "office building." By 1938, he was in a different line of work. On his naturalization papers, his occupation was listed as a "seaman." That wasn't the complete story though. Luckily, I came across records for a few of his travels. He was a waiter on board the SS Saint John! This shows a partial list of the crew who arrived in New York on August 3, 1938 from the port of Yarmouth, Nova Scotia. 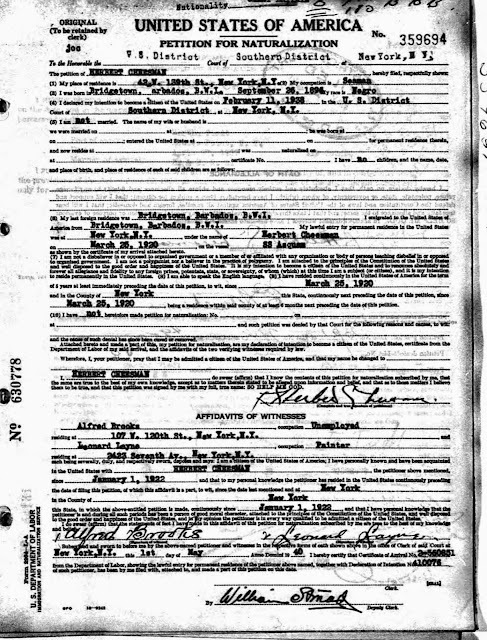 In fact when I reviewed through Ancestry.com's New York Passenger Lists, 1820-1957 on-line database, I found Herbert listed on a several ship manifests during the years 1938--1940. He would sail from New York to Yarmouth, Nova Scotia quite often. 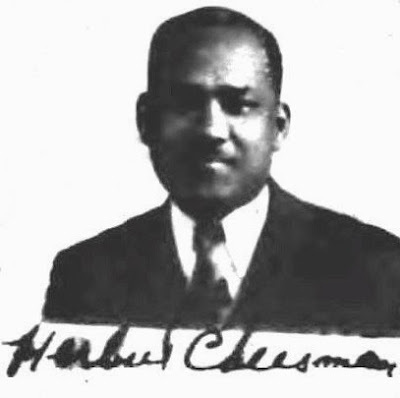 In 1940, Herbert Cheeseman was still living at 42 West 139th St. His sister, Eleanor Cheeseman, and Gertrude Dallas, a lodger, resided there as well. His occupation was accurately noted as "waiter" on a "boat." My grandfather, Harold Murrell married my grandmother Ethel in 1932 so I am guessing that's probably the year that he moved out of Herbert's place. On January 20, 1941 Herbert took the Oath of Allegiance and became a U.S. citizen. From this point on, his circumstances took a turn for the worse. His World War II Draft Registration Card indicated he was unemployed. Perhaps he had fallen ill? The reason why I think he may have been sick is this. I will have to order the death certificate to find out what happened. I'm All Smiles. It's My Fourth Blogiversary!